Watercolour of a religious enclosure at Mahrauli from 'Views by Seeta Ram from Gheen to Delhi Vol. VI' produced for Lord Moira, afterwards the Marquess of Hastings, by Sita Ram between 1814-15. Marquess of Hastings, the Governor-General of Bengal and the Commander-in-Chief (r. 1813-23), was accompanied by artist Sita Ram (flourished c.1810-22) to illustrate his journey from Calcutta to Delhi between 1814-15. 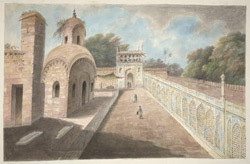 Idealised view of a religious enclosure with tombs and a white marble arcade of 'jalis' converging on a Mughal gateway with a Muslim tomb beside it. This religious enclosure resembles the arcade at the shrine of Qutb-Sahib at Mahrauli. Mahrauli, a village near Delhi, is the site of dargah (shrine) of Qutb-Sahib (d.1235) and the location of several tombs of the Kings of Delhi including Muhammad Akbar II (d.1837), Shah Alam II (d.1806), and Bahadur Shah I (d.1712). Inscribed below: 'Part of the Madrissa Nobut Kanah and Tombs that under the Semineeanah being that of the Emperor Shaw Allum's Moulavie'; and in pencil in 'kaithi: dili madirasa pautasa pir ivan'.